Pictured is Stanley Denton, Ph.D., (far left) Point Park associate professor of education, with Eugene Walker, Christopher Robinson and Terrance Hudson, representatives of the Black Men Teaching Initiative. 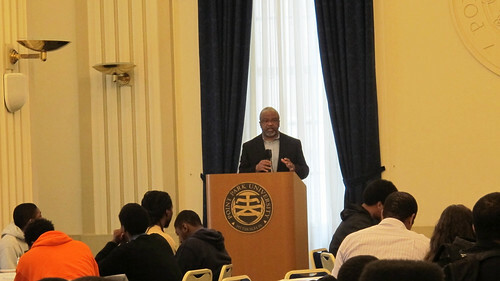 Point Park University welcomed approximately 100 high school students to campus May 7 for a conference focusing on the need for more black male teachers in America's schools as well as the various opportunities and benefits the teaching profession offers. The inaugural "Ever Consider Teaching?" conference is part of the Black Men Teaching Initiative, a consortium made up of faculty and staff representatives from Point Park University, Indiana University of Pennsylvania, California University of Pennsylvania and the Community College of Allegheny County. The program's goal is to increase the population in colleges of education to five percent and increase the overall number of African-American male teachers in the region to five percent. Current statistics indicate that African-American men make up about one percent of the population of college education majors and less than two percent of the three million teachers in the United States. "Point Park University was selected as the host of the conference because of its long-standing track record of responsible community engagement and its central location in Downtown Pittsburgh," explained Stanley Denton, Ph.D., associate professor of education at Point Park. "The event was generously supported by a grant from The Heinz Endowments to Dr. Robert Millward of IUP." The event at Point Park began with a welcoming reception, followed by a keynote address from Melvin Jenkins, Ed.D., professor and chairperson at IUP, and then breakout sessions on the various academic programs and admissions requirements associated with earning an undergraduate degree in education. Rev. Lamar D. Lee, Jr., Ed.D., gave the closing address. "During the breakout sessions, we stressed to students the importance of a culturally diverse workforce in education and emphasized Point Park's commitment to a community of mutual respect for diversity," Denton said. Students from Gateway High School, Propel Andrew Street, Propel Braddock Hills, Propel Homestead, University Preparatory School and Wilkinsburg High School attended the conference. Daniell Matthews, senior associate registrar/director of registration at Point Park, coordinated the conference. For many of the students, this was their first visit to a college campus. The following is feedback from students at Propel Andrew Street. "It was a great opportunity. The event taught me that an education is the key to success." - Khalil White, a sophomore. "It was a powerful experience. They were passing the baton to our generation." - Emanule Cargile, a junior. "I think it is great that they put this together to try to get more African-American males involved in education because very few students have African-American male teachers, mentors and role models." - Nazim Burton, a sophomore. Learn about the various majors offered in Point Park's undergraduate education program and check out the University's education faculty members.